Terra Mapper is a single platform for photogrammetry that convert photos into 3D point clouds and orthomosaic images. The ability to create accurate 3D modeling from raw data captured from drones and ground cameras is now completed with ease. Terra Drone is set to release a new image processing software called "Terra Mapper" for commercial use in August 2017 They have developed both the Cloud and desktop version. Terra Drone Co., Ltd. (Head Office: Shibuya-ku, Tokyo, CEO: Tokushige Toru) have launched their image processing software "Terra Mapper" designed to assist drone surveying services. Terra Mapper is an automated drone navigation, image processing, and 3D image analysis program. It can be utilised on its own, rather than requiring the use of multiple different supplementary software. Terra Mapper enables users to accurately inspect the 2D & 3D data images produced by their nominated drone service, allowing effective analysis at a more cost-efficient price. By exploiting the knowledge and know-how we have accumulated over the completion of the 400 drone surveying projects, we also offer ongoing support to users, helping them perform internal photogrammetry surveys. In the past, drones have been used for aerial photography as a hobby. In 2016, Terra Drone has evolved this consumer trend to become embedded into the workflow for increased productivity in the civil engineering industry. In Japan, the Ministry of Industrial Relations has been promoting "i-Construction". As a result, all large-scale surveying projects in 2020 will adopt the use of drone technology, generating over 300 million yen. Terra Drone has released a cloud and desktop version of "Terra Mapper", a comprehensive platform to further expand the scope of drone capabilities in the future. Through Terra Mapper, Terra Drone will continue to promote the effective use of drones extending beyond ‘i-Construction’. We strive to satisfy a wider range of specific consumer needs by having both the cloud and the desktop version. In Terra Mapper Cloud, Terra Drone offer construction management tools to monitor the numerical change in components such as soil volumes and elevation levels at the site. The data is also readily available, so they can be used as reference materials on and off the site. Terra Mapper Cloud is a platform for sharing information between project members. In addition to sharing information and incorporating a chat function, it can also delegate tasks, allocate the placement of equipment and monitor the progress of the site. Terra Mapper desktop has the ability to universally process, analyse and share all types of data from flight to ground. Running Terra Mapper desktop can cost as low as 1/5 of the price when comparing to other software. Design is simplistic, operation is with ease, and analysis in-depth. More accurate topographical data can be measured by displaying and automatically eliminating the unnecessary components on site including construction equipment and foliage in the field, ultimately allowing an accurate detection of soil to be removed, the amount of soil and cross sections of the land. 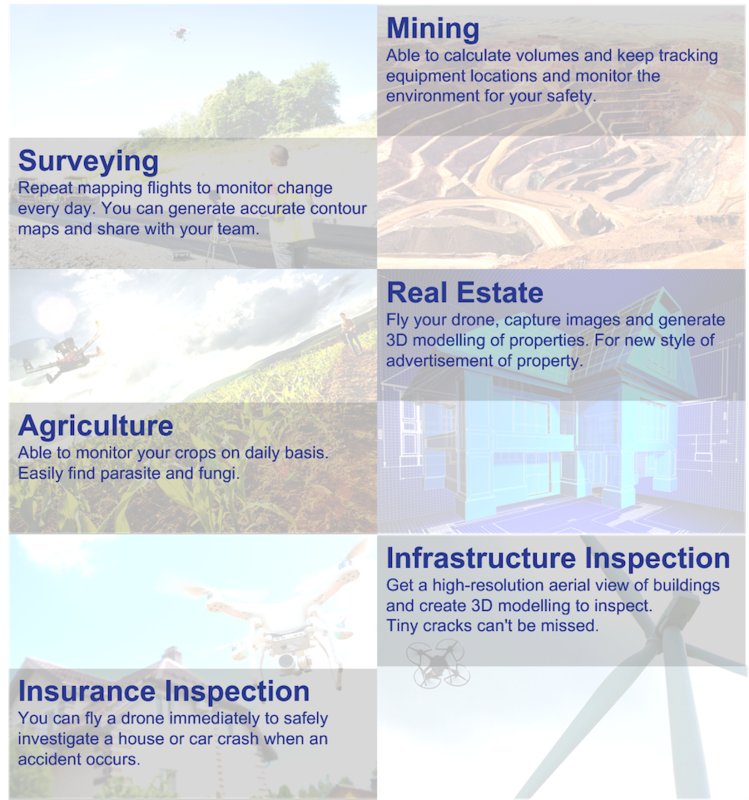 Terra Mapper can be utilized in various industries such as Surveying, Mining, Agriculture, Inspection, Real Estate, Inspection Insurance and more!